PHOTO BY MATT BURKHARTT LNY adds a chain link fence to his mural at 852 Joseph Avenue, which also features a portrait of Frederick Douglass. “When you’re working in a city, you’re using the city, the history, as a medium,” he says. Thursday was Day 7 of the 10-day Wall\Therapy street-art festival, with at least eight murals completed and many more nearing completion. Wednesday night, an artist talk was held at School of the Arts, which included a panel of six muralists who engaged in a discussion led by Wall\Therapy co-founder Dr. Ian Wilson. The panel included Maxx Moses/Pose2 (NYC), Mr. Prvrt (FUA Krew, Rochester), Gaia (Baltimore), LNY (NYC), Freddy Sam (Cape Town), and Sarah Rutherford (Rochester). The artists discussed their backgrounds, whether their early street- or studio-art endeavors had familial and community support, what informs and inspires their individual creativity, and the many complex facets of creating public art. On the one hand, street art is immediately consumable and accessible to everyone, unlike art that exists only in pay-to-view-it galleries, says LNY. And though much street art pops up in hip, artsy neighborhoods, it is still not widely accepted as part of the high art, white-walls cannon. Although the festival has received overwhelmingly positive feedback, some of the more persistent contention about specific murals is in regards to the complexities of creating unaudited art in public spaces. Some members of the community persist in claiming that certain imagery is offensive and should be removed. Contrary to these community members’ claims, the artists on the panel said that they approach mural-making with sensitivity. Gaia’s grid of images on the South Wedge Planning Committee building at 224 Mount Hope Avenue incorporates such Rochester iconography as the Mercury statue, the Xerox building, the Aqueduct building, as well as a portrait of an anonymous Rochester kid in a White Sox hat. When I spoke with him earlier in the week, he said he was working with symbols that alluded to culture losing the race against commerce, which isn’t just a Rochester story. LNY is working along a similar vein of thought in his mural, which is nearly finished at 852 Joseph Avenue. His painting incorporates a portrait of Frederick Douglass, Corinthian pillars, flowers weaving themselves into a chain-link fence, and he has said he plans to add a portrait of Trayvon Martin. LNY says he uses metaphors and symbols as a public language, and the thoughts behind this painting involve the sublimation of individual history when certain lives and deaths take on greater meanings, and begin to represent more than the individuals alone. This led to a discussion of "art by committee," or juried mural projects, which Wall\Therapy is not. “Once you have a structure that creates art, like a mural arts program, it becomes totally top-down and that cuts off a lot of creativity,” says LNY. By adding bureaucracy, the project becomes about communities talking to each other instead of about art, and the process of creating becomes very slow, says Gaia. 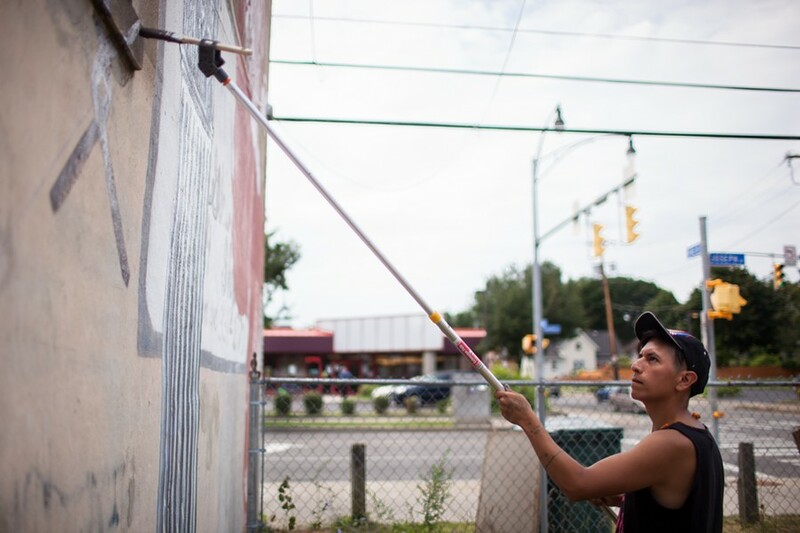 At the close of this season, between 27 and 30 murals will have been created in one week, very quickly, with an instant creative energy permeating the Rochester communities. The excitement over the paintings has been evident among spectators gathered at the sites, and throughout social media all week. For more information and images of the mural progress, follow @roccitynews on Twitter and check back for future posts.